I've been wanting to make these for a long while. Every time I read the recipe I could imagine how the the cheesey-oniony goodness would just melt in my mouth. I was not disappointed. If you're comfortable with yeast and shaping dough then making these buns will be a rewarding experience. Just give yourself time to complete the whole process and be prepared to amaze yourself and anyone you care to share with. Next time I think I'll add more cheese. The recipe comes from Gunn's in Winnipeg, They make tons of yummy goodies and now you can too. In a small bowl, dissolve 4 tsp of the sugar in warm milk. Sprinkle in yeast; let stand until frothy, about 10 minutes. Meanwhile, in a large bowl and using an electric mixer, beat eggs. Remove 2 tbsp of the beaten egg; reserve in small airtight container in refrigerator. Add remaining sugar to beaten eggs in bowl; beat until thick and pale yellow, about 2 minutes. Stir in yeast mixture, oil and salt. With wooden spoon, stir in enough flour to make a slightly sticky dough. Turn out onto lightly floured surface; knead, adding as much of the remaining flour as necessary to prevent sticking, until smooth and elastic, 10 to 12 minutes. Place in greased bowl, turning to grease all over. Cover with plastic wrap; let rise in warm place until doubled in bulk, about 2 hours. Line 2 rimmed baking sheets with parchment paper; set aside. Punch down dough, turn out onto lightly floured surface. Divide in half. Roll each half into 12 x 8-inch (30 x 20 cm) rectangle. Brush each with half of the melted butter, leaving a 1/2 -inch (1 cm) border uncovered; sprinkle each with half each of the cheese and poppy seeds. Brush edges lightly with reserved beaten egg. Starting at long side, roll up; pinch seam to seal. Cut into 2-inch (5 cm) thick slices; place, about 2 inches (5cm) apart, on prepared pans. Press to flatten to 1 inch (2.5 cm) thickness. Cover with clean tea towel and let rise in warm place until doubled in bulk, 1 1/2 to 2 hours. Brush lightly with reserved beaten eggs; sprinkle with onion. Top each with 1 tsp mayonnaise. Bake in top and bottom thirds of 375 F (190 C) oven, switching and rotating pans halfway through, until golden and buns sound hollow when tapped on bottoms, 25 to 30 minutes. Transfer to rack, let cool. Makes 12 large buns. Chocolate and more chocolate is pretty much what you'll get if you make these muffins. They remind me of the chocolate fudge muffin from Mmmuffins - dense and dark. I made them a little healthier by replacing some of the all-purpose flour with whole wheat. No one knew. Don't overbake them or they'll be dry and a dry chocolate muffin is no fun at all. Preheat oven to 400F. Grease a 12-cup muffin pan or line with wrappers. In a medium bowl, stir together the flour, sugar and baking soda. Set it aside. In a medium saucepan over low heat, melt together the butter and unsweetened chocolate. Stir until smooth, then remove from heat and let cool for just a minute. Add the buttermilk, egg and vanilla, whisking the mixture until everything is well combined. Stir in the flour mixture, mixing just until all the ingredients are moistened, then add the chocolate chips. Mix until the chips are evenly distributed. Spoon batter into well-greased (or paper-lined) muffin pan, filling the cups to the top. Bake for 15 to 20 minutes, or until a toothpick inserted into the middle of a muffin comes out clean. Let cool for a couple of minutes before removing from the pan, then transfer to a rack to cool more or less completely. Makes 10 chocolate chocolate muffins. Happy New Year! 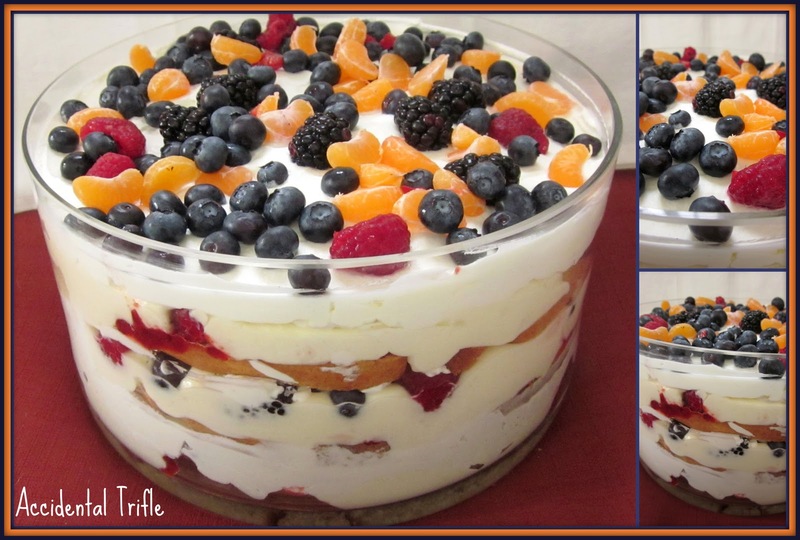 To start things off with a bang here is the trifle I made for Christmas. Contrary to its name, it was no accident - every component was planned out. It was sweet, creamy delicious and massive. I only have one glass bowl so I had to almost double it so it wouldn't look wimpy. There are hundreds of trifle recipes out there and no doubt you have a favourite one. If you're new to trifle-making, this is a good recipe to try out. The basics are there - cake, custard, whipped cream and fruit. Total yumminess in every bite. You can use store-bought products or homemade, whichever you prefer. Personalize it to your tastes and prepare to wow everyone. Cut the cake up into slices, as evenly as you can - they can be ragged or funny shaped: it doesn't matter. Prepared fruit (wash, slice, peel do whatever must be done) and toss it with 1/4 cup of the sugar. Prepare the cream filling and let cool. Pour the whipping cream into a large bowl and add the remaining 2 tbsp of sugar. Beat with an electric mixer on high speed until the cream is thick and holds a soft peak when you lift the beaters from the bowl. Set aside. Arrange about half of the cake slices in a layer on the bottom of your prettiest glass bowl (approximately 8-inch/20cm in diameter). Sprinkle the cake slices with sherry, then spread with half of the jam. Top with half of the fruit, then slather with half of the cream filling. Cover with half of the whipped cream. Now repeat: the rest of the cake slices, more sherry, the rest of the jam, the rest of the fruit, rest of the custard and the rest of the whipped cream. Smooth the top of the whipped cream and decorate with a few extra berries. Makes 8-10 servings. Blend together the milk, eggs, 1/3 cup sugar, cornstarch and flour. Blend until smooth, then pour into a medium-sized heavy saucepan. Cook, stirring almost constantly with a whisk, over medium-low heat until the mixture becomes smooth and thick - 5 to 8 minutes. Do not leave this stuff alone for a second. It will thicken suddenly and without warning. Remove from heat and stir in the butter and vanilla, whisking until smooth. Cover the surface of the hot custard with a layer of plastic wrap (to prevent a skin from forming), and refrigerate for an hour or two until completely cooled. With an electric mixer, beat the whipping cream with the 1 tbsp of sugar until stiff. Peel the plastic wrap off the custard and beat briefly with the mixer so it is smooth and creamy. Gently fold in the whipping cream until fully incorporated. Now its ready to use in your trifle. Notes: I made my trifle without sherry and used strawberry jam.